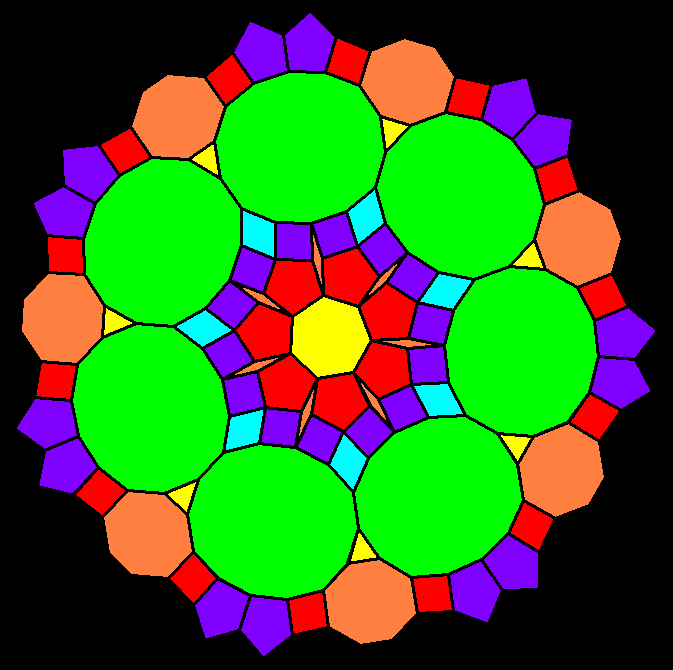 Heptagons only appear infrequently in interesting polyhedra. I recently found a few that I like. To form the first of these solids, shown above, I started with the icosidodecahedron, dropped the symmetry of the model from icosahedral to tetrahedral, and then stellated it twice using Stella 4d (available here). To obtain the model shown below, which also features heptagons and triangles, I stellated it once more. Both of these polyhedra have pyritohedral symmetry. To form the next model shown, I began with an rhombicosidodecahedron, set it to tetrahedral symmetry, and stellated it eight times. This produces a chiral solid with tetrahedral symmetry. For the last of these four polyhedra featuring heptagons, I began with the snub dodecahedron, dropped the symmetry of the model down from icosahedral to tetrahedral, and then stellated it sixty-one times. The resulting solid is chiral, with tetrahedral symmetry. Created using Stella 4d: Polyhedron Navigator; see this website to try it for yourself! For some reason I do not fully understand, polyhedra featuring heptagons, even if irregular, do not appear often, at least not in my geometrical investigations — so I was pleased to find these three, using Stella 4d: Polyhedron Navigator, available at http://www.software3d.com/Stella.php. It is hard to find polyhedra which contain regular heptagons, but that simply makes the search more challenging, and therefore more fun. This polyhedron features six regular heptagons, and was created with Stella 4d, software available here. This is the weekend that Daylight Saving Time (or DST) ends in most parts of the USA, which means that this is the only weekend of the year, here, which lasts 49 hours, rather than the usual 48. After making one of these, I then rotated it 1/49th of a full rotation, repeatedly, until I had seven of them inscribed in the circle. 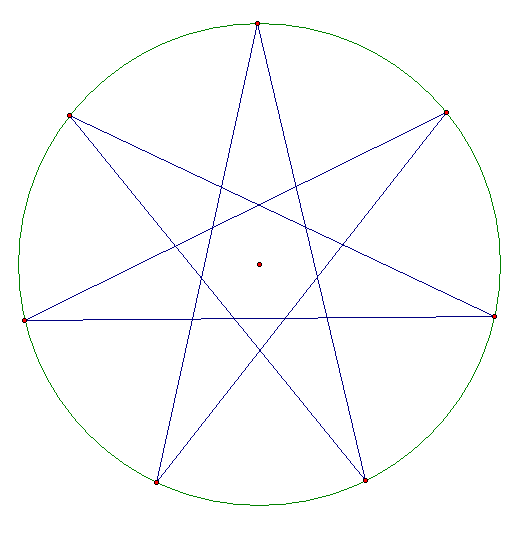 Seven times seven, of course, is 49, so this created one type (many are possible) of 49-pointed star. Also, I had already extended the line segments to form lines, so that this geometrical design would extend outside the circle. Next came thickening and blackening these lines, as well as the circle, and re-coloring the red points to be black, as well. 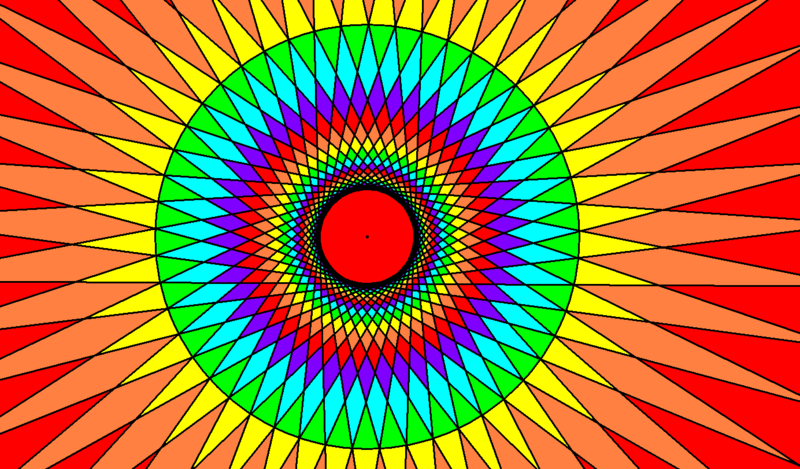 All of this work was performed using Geometer’s Sketchpad. I then took a screenshot, moved the design to MS-Paint, and used that program to add the colors seen in the image at the top of this post. I don’t like Daylight Saving Time, and never have, but I do enjoy the end of it, when it arrives once each year, and we get our “missing” hour returned to us — the one which was stolen from one of our weekends in the Spring. To those who live in areas which do not observe DST, such as most of Arizona, you are fortunate — at least in this one respect. Heart attacks actually increase when DST starts each year — a fact which can be easily verified with Google. There are other problems with DST, as well. Daylight Saving Time (one of the worst ideas Benjamin Franklin ever had) should be abolished. Everywhere.